In Kentucky, a family watches a herd of cattle running past their home, on fire. A spaceship explodes before it returns to Mars, and hundreds of other Martian ships leave Mars and head towards Earth. President James Dale along with his aides addresses the United States concerning the historic event. People around the country follow the story. The President’s science aides set up a first contact meeting with the Martians in Pahrump, Nevada as President Dale watches the development on TV with his wife Marsha and his daughter Taffy. 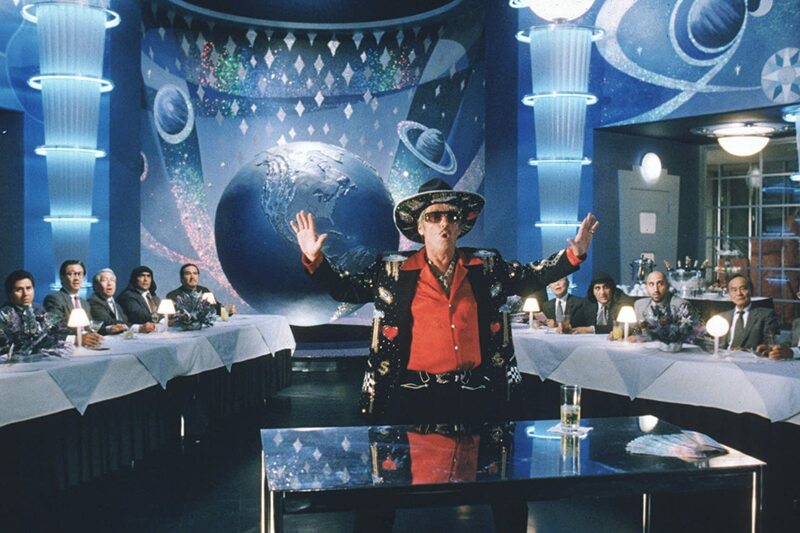 Using a universal translator, the Ambassador of the Martians announces that they intend to colonize the Earth. To prevent this intention from causing panic, the translator is reprogrammed to say that the Martians “come in peace”. When a hippie releases a dove as a symbol of peace, the Ambassador shoots it, then he and the other Martians slaughter a large number of people at the event including General Casey, news reporter Jason Stone, and Billy-Glenn Norris before capturing chat show host Nathalie Lake and her pet Chihuahua Poppy whose heads they transpose. Thinking that the Martians assumed that the dove was a symbol of war, President Dale tells Professor Donald Kessler to negotiations with the Martians, whose ambassador is invited to address the United States Congress. At this meeting, the Martians massacre most of Congress. Donald begs the Martian Ambassador to stop, but is rendered unconscious and taken aboard their ship where he is later shown with his body parts dismembered and his disembodied head remaining animated. General Decker tries to convince President Dale to retaliate with nuclear warfare, but he refuses. 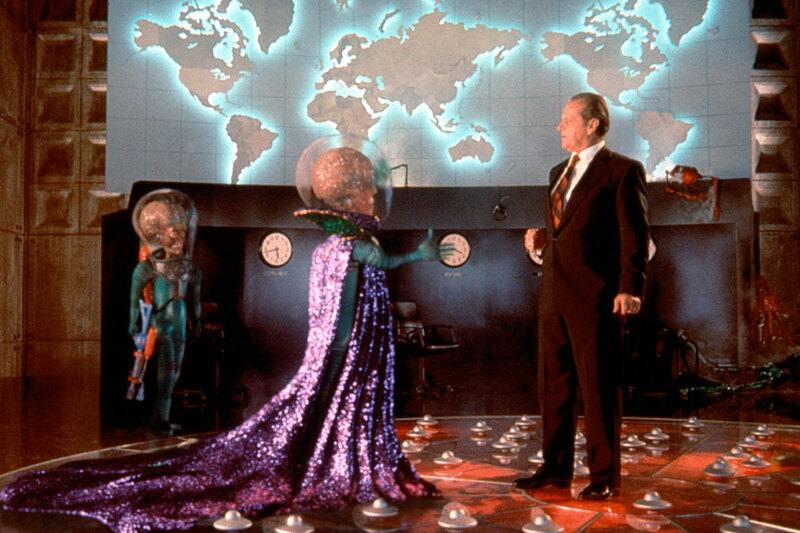 The Martians invade Earth, starting with Washington, D.C. The White House is attacked by the aliens, and the Secret Service tries to rush the President and the First Lady to the bunker while Taffy is separated from them during the chaos. Byron’s sons who were on a tour get separated from their group during the rush to escape, grab the weapons of some Martians killed by the Secret Service, and start fighting back. Marsha is crushed to death by the Nancy Reagan chandelier; the President, however, escapes. After the U.S. government unsuccessfully attempts a nuclear attack on the mother ship, the Martians exact revenge by defacing world landmarks for amusement. As the Martians ravage Las Vegas, with Art Land being one of their victims, Byron Williams, a casino employee and former world champion boxer, leads a small group of survivors consisting of Barbara Land, Tom Jones, a waitress named Cindy, and a gambler to an airfield in the hopes of flying a small jet to safety. They barely make it, losing the gambler in the process, but they discover a large group of Martians stationed there. Byron creates a diversion by challenging them to a fistfight. While he succeeds in killing the Ambassador, he is outnumbered and overwhelmed, but Tom, Barbara, and Cindy escape. Billy-Glenn’s brother Richie discovers that the Martians’ heads explode when they hear Slim Whitman’s “Indian Love Call.” He and his grandmother Florence drive around town, using the song to kill Martians. The military thereafter broadcast the song around the globe, killing most of the Martians and their leader and causing the few remaining survivors to either flee from Earth or surrender. Nathalie and Donald kiss while drowning when the Martian spaceship crashes into the ocean. In the aftermath, Richie and Florence are awarded the Medal of Honor by Taffy, with her being the only surviving member of the government. Byron, who survived his Martian brawl, arrives in D.C. to reunite with his former wife and their two sons as the Martians’ bodies are being cleaned up. Barbara, Cindy, and Tom Jones emerge from a cave with some animals to see a crashed Martian ship in the adjacent Lake Tahoe. 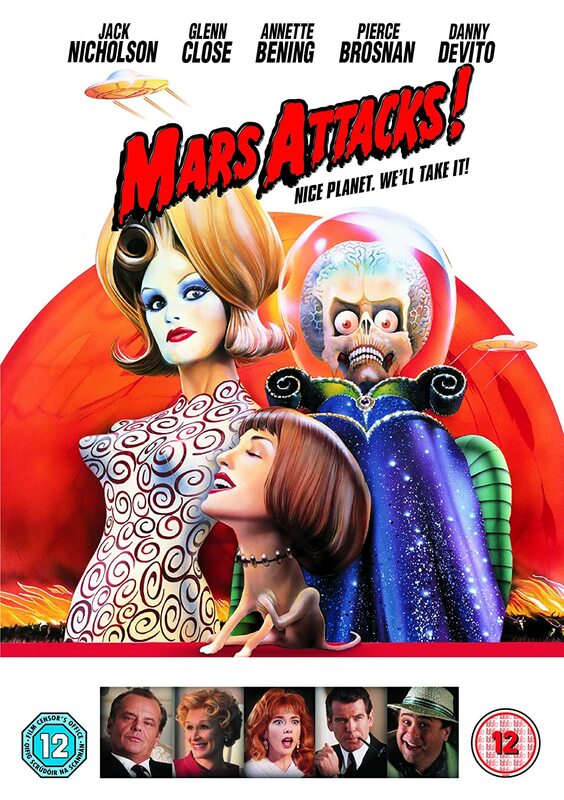 film that wouldn’t have worked under the auspices of a director other than Tim Burton, ‘Mars Attacks’ is a wonderful entertaining sci-fi movie that is still as much fun today as it was upon release.